Vintage wedding photos were displayed in the foyer and fresh flowers adorned white linen tablecloths for the celebration. A great-grandchild presented artwork on an easel. Judy Greer Hensley, sister of the bride, and her husband Lloyd traveled to the celebration from their home in Baton Rouge, Louisiana. Steve Greer, brother of the bride who served as young usher in the wedding, and his wife Susan also attended the celebration, traveling from Athens, Georgia. 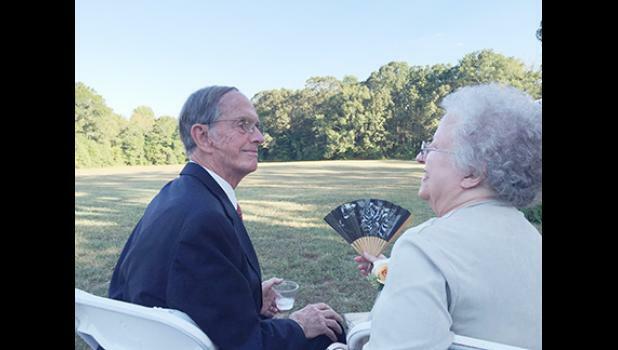 The bride’s brother, the late John David Greer, was also an usher in the wedding. His widow Betty Greer attended the luncheon. Guests enjoyed white anniversary cake decorated with the original bride and groom topper from the couple’s wedding. Valentine, birthday and anniversary cards exchanged between the couple for the last 60 years were shared among the group. The event culminated with hymns sung around the piano. Mr. and Mrs. Crook were married by the groom’s father, Rev. Cullen B. Crook, who was pastor of Pleasant Grove Baptist Church, on Aug. 17, 1957. Mr. Crook is the son of the late Rev. and Mrs. Cullen B. Crook. He retired from John D. Hollingsworth on Wheels as designer of textile machinery. Mrs. Crook, the former Corrie Elsie Greer, is the daughter of the late Ruth and John H. Greer. They are the parents of Kimberly Crook Lee (Rick), of Rock Hill; Jan Crook Brown (Jerry), of Rock Hill; and Brian Crook (Tama Rollins Crook), of Greer. They have nine grandchildren and two great-grandchildren. The couple are lifelong residents of the Pleasant Grove community in Greer and active members in leadership positions at Pleasant Grove Baptist Church. Mrs. Crook also celebrated her 80th birthday on Aug. 9. All grandchildren and great-grandchildren were in attendance except grandsons, Austin and Richard Lee, who are both officers in the military. They called with best wishes during the celebration.